Project Management | Fancom Connects Ltd. The term project management can apply to just about any project. Fancom is primarily involved with enterprise level projects that require IT communications or electronic security design although the oversight methodology used by Fancom for the communications aspect of a project can be equally applied to the entirety of any given project. 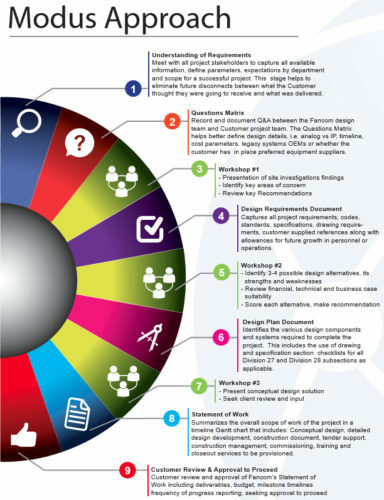 There are several well-deﬁned stages to any project each having a speciﬁc purpose. 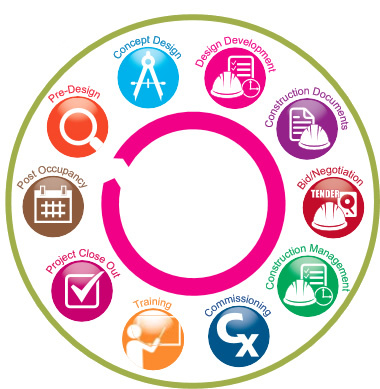 Each completed project stage acts as the foundation to the following stage. While the speciﬁc list of tasks to be accomplished at each stage will vary with the project, the overall ﬂow of work from one project to another is fairly constant. At Fancom we’ve captured these stages with a consistent approach we call the Modus Approach. Successful project delivery requires collaboration with various client functional groups such as IT, Facilities, Security and Senior Administration. At the same time, any worthwhile collaboration should also include all disciplines on the construction team – architect, mechanical and electrical engineers and others involved in the successful completion of the project. Incorporated into a good project management process are two other important considerations that should be considered throughout the project – QA/QC and Risk Management. Quality Assurance ensures that the customer receives what they want in terms of features – wireless voice communications, state of the art AV system, appropriate video surveillance and access control systems, adequate ﬁ re protection, proper utilities management etc. Quality control ensures the systems within the building meet all required legal and other regulatory requirements and meet industry best practices and relevant standards. Risk Management is the process of continually monitoring the project expectations against planned outcomes in areas of scope, cost, time and quality. Deviations from the plan on any of these parameters need to be identiﬁed and remedied or escalated to a senior authority for timely resolution. Project Management is a recognized professional discipline. Assurance that your project is being managed by a qualiﬁed person comes in the form of the PMP designation carried by such individuals having qualiﬁed through the Project Management Institute http://www.pmi.org/.